This was the most radical of the old Tourist Trial overhauls. The first problem with the old Mountain Tourist route is that it went along the main moor road. The second problem is that it simply wasn’t tough enough, if you’re going to include ‘Mountain’ in the title then the route needs to earn it somehow. Not that there are any mountains on the North York Moors, but what it does have is some really tough climbs, which brings us to the question of Caper Hill and will me and Dave be forgiven for putting it in? More of that later, but can I just say at this point that it was Dave’s idea. The standard route was 45.1 miles with 4,793 ft of climbing, the extended route a little longer at 53.7 miles with 6.176 feet of climbing. In terms of feet climbed per mile just about as hard as it comes. It would certainly test the mettle of those who opted to haul a bike with a saddlebag and full mudguards over this type of terrain to claim the extra points. Both routes started at the car park near the Tourist Info kiosk in Great Ayton and all 26 riders rolled out more or less together and it stayed that way for all of about 5 miles when the first of many ‘lumps’ was encountered just beyond Kildale. From this point onwards flat road could be consigned to the thing of dreams as riders began to consider if they would do the standard route or opt for the extra challenge of taking in Rosedale Chimney and Blakey Bank. Soon we had a couple of casualties – Calum to a broken front wheel near Castleton, Graeme Tate to a puncture just after Lealholm – but remarkably there were few over the course of the day. I thought momentarily about stopping but I was riding in a small group with Dave Kirton who was in no mood for such concessions, in fact he started to up the pace ‘we need to get our foot down’ was his mantra for the day. The section from Castleton to Lealholm is probably as easy as it gets and even that isn’t easy, but now we were approaching Glaisdale and the horrors that lay in wait. As I said before including Caper Hill was Dave’s idea. I went up it three times last year, two of those with Dave, and I can only assume that he’d forgotten about it as he wasn’t exactly in the best of shape at the top, not that anyone is by the time they get there. It’s a relentless climb, not as steep as the steepest section of the Chimney but it sustains the pain for longer over a horrible rutted surface and is arguably its equal. You are certainly glad to see the junction at the top when it finally comes into view. The route here went left and was actually flattish for about a mile. Steve Murphy used his local knowledge to good effect and went right instead down into Lealholm before riding back up to complete an extended extended route. This wouldn’t have been so bad if he hadn’t taken poor old Richard Danks with him! Whatever route you’re doing the pain was far from over though. For those doing the standard route there was still the long Bell End Farm ascent from Rosedale followed by the tough route down through Westerdale. For those of us doing the ‘option’, which was probably about half the field, it was left in Rosedale, not right, and up the Chimney, always a test, the steep section always ridiculous and just a case of survival rather than any pretence of riding smoothly up it. Next up was Blakey Bank right from the bottom of Farndale at Church Houses, tough enough just to get there down the rolling valley road. Where Caper Hill is relentless and the Chimney is super steep Blakey assaults you a little less but is longer and in its way every bit as hard, especially as you can see it all laid out before you. At the start of the steepest section I noticed that Dave was beginning to huff and puff a bit and although I was hurting too a gap began to grow so I turned the screw a little. Dave had chosen not to take any notice of Bryan’s wise words at the start ‘remember it’s not a bloody race!’ and was in combative mood, the question was should I wait? But then a memory came back, a dark memory. About a year ago while still recovering from an appendix operation Dave put me to the sword on the big Westerdale climb and showed no remorse as he sped off into the distance leaving me to grovel to the top without dignity. I kept going, I knew he would do the same; it’s what he would have wanted! The two routes came back together at Ralph’s Cross before tackling the road back through Westerdale. Dave has a reputation for looking dead and buried only to them miraculously recover and pop up on your shoulder and attack you and I knew he wouldn’t give up so I had to press on in order to get first dibs on the pastries at Suggitts. This bit really is the sting in the tail to either route, the climb up after the ford at Hob Hole being particularly gruelling, removing any last reserves of energy as you grind up. 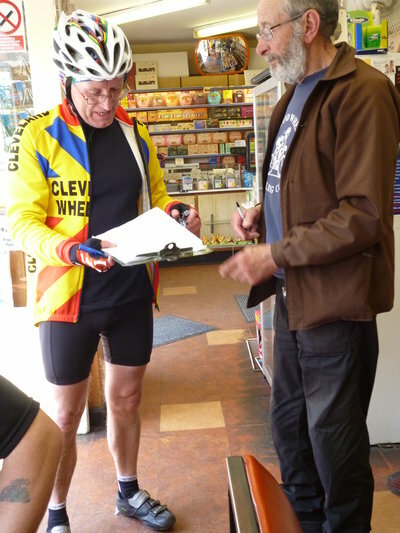 I bumped into John Price just outside Ayton as he was finishing the standard route and we both arrived at Suggitts to get signed off just after 12.15. Dave arrived shortly afterwards and not long after that Lee O’Leary arrived and the rider of the day Glen McCusker who had ridden down from Rosedale, completed the extended route and then rode back afterwards and on an old steel framed bike with down tube shifters, an incredible ride, Dave likened him to Robert Millar! 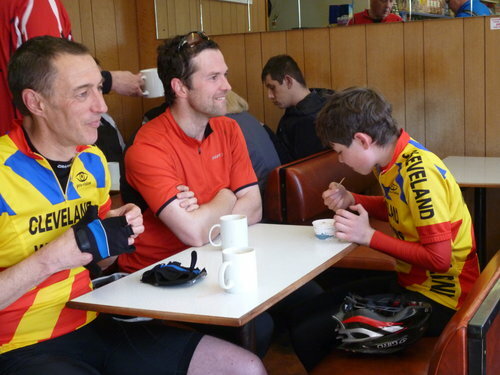 Toby Tanfield aged 13 also did the longer route and seemed relatively fresh at the end, a great ride. But the moment of the day for me was when Mick Storey turned up. We were getting worried about him, Dave speculating that we might need to get him airlifted out of Rosedale when he suddenly popped up having done his own hybrid route involving the Chimney and that ‘Caper Thing’. He had a look that somehow combined shock, total bewilderment and enjoyment. He could hardly move any part of his body in any direction and he knew he’d been in a ride, we couldn’t stop laughing as we shared his pain. But for someone who only started road riding around a year ago when he turned up for a club run with rapid fire shifters somehow attached to drop bars and clad in a boil in the bag cape it was some achievement. In fact just getting round a route like that was an achievement for all the riders, each managing to dip under the 4 hour 30 minute cut off and get a nod of approval from Head Commissaire Bevis. Feedback at the end of the ride and subsequent comments have been very positive from those that did the ride. A great success I think! Below is a list of all 22 riders who finished, well done all!